It takes a brave heart to open a new restaurant these days — especially one like this. In many ways, it’s the ideal formula: Inexpensive, clean as Martha Stewart’s whistle, cute, friendly, delicious. But for some reason, despite the number of Asian residents, excellent sushi restaurants and adventurous student population, Vietnamese food has never caught on in Knoxville. T. Ho, as far as I know the only Vietnamese place in the city for decades, closed a few months ago. 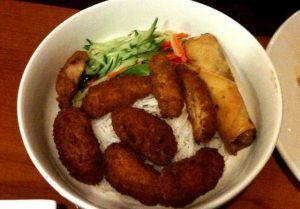 Vietnamese Bistro, opened in December in Farragut (in the booming Turkey Creek area, just a hop from the movie theaters), aims to change the paradigm. “Bistro” is the right description for this gleaming, modern spot with burnished concrete floors, a few upholstered booths and a flock of wooden tables and chairs. The French word meaning “quick” works well for this casual atmosphere, as well as for a cuisine so molded by French colonization. Thus you’ll find baguettes in the Vietnamese banh mi sandwiches, dark roast coffee, many fresh herbs and a more delicate palate, alongside Chinese cooking methods like stir-frying. Our group included a vegetarian, and the menu offered him several veggie and “fishetarian” options, including tofu or veggie alternatives of the meat-centric dishes. We started with summer rolls, served with fish sauce (they call it “citrus sauce”) and sweet-savory peanut sauce. The kitchen sent out a complimentary goi ga salad they’ve just added to the menu — tender, pulled white chicken with thinly shredded cabbage and a mild, sweet-vinegar dressing, flecked with fresh basil and finely ground peanuts. We made short work of it. Two of us ordered what turned out to be well-executed versions of dishes I’ve often found in Chinese restaurants — Spicy Noodles (bun gao xao kho) were much like the curried rice noodles with egg and usually baby shrimp (here, by choice, chicken) known as Singapore noodles. 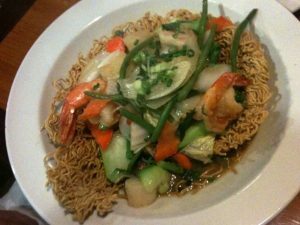 The Vietnamese Bird’s Nest was much like a dish I’d often ordered in a New York Chinatown restaurant — crisp, curled egg noodles nestling scallops and vegetables in a light white sauce. Two of us ordered bun dishes. 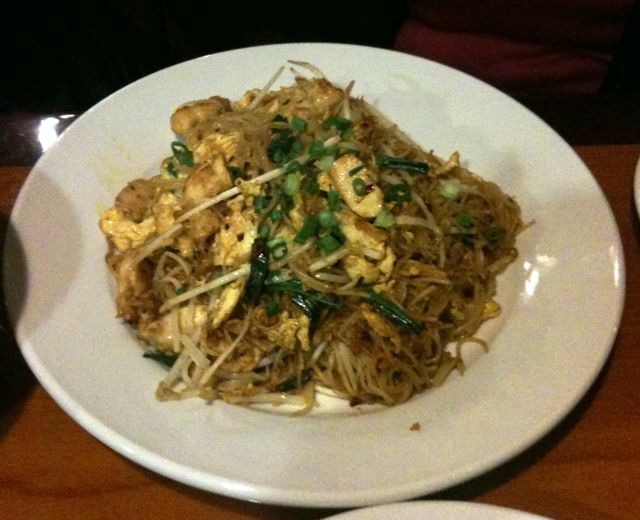 A word here about rice noodles, obviously a Vietnamese staple: If you’re not familiar with their softly delicious texture or delicate flavor, do yourself a favor and try them — warm, cool, or in soup, they pal up to the other ingredients like a new-found best friend, countering spice with mildness, crunch with slurp. 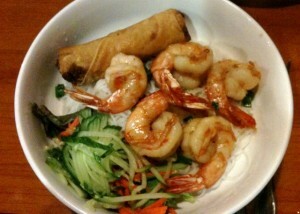 My bun dish featured big grilled shrimp, deveined, just cooked through, with a brilliant array of ribboned vegetables. These are not the blow-your-hair-back flavors you’ll find on Atlanta’s Buford Highway, but thoughtful, balanced dishes that serve well as introductory Vietnamese. To be fair, our choices were entry-level, compared to the more complex and novel items also available — crab-stuffed rainbow trout, free-range chicken with mashed potatoes, green beans and peanut sauce, soft shell crab, and even quail with a port reduction sauce. You can even get steak and mashed potatoes — with a mushroom demi-glace, no less. The cappuccino creme brulee had a tasty custard, but the burnt-sugar crust was so thin as to be barely detectable. Still, in all, the meal was more than enough to ensure we’d return, for lunch (when prices are even more affordable), or back for dinner next time we go to the movies. Please, Knoxville — give Vietnamese Bistro a chance. You’ll be doing yourself a favor. Your case was so well-formulated, so convincing, that I will forthwith.